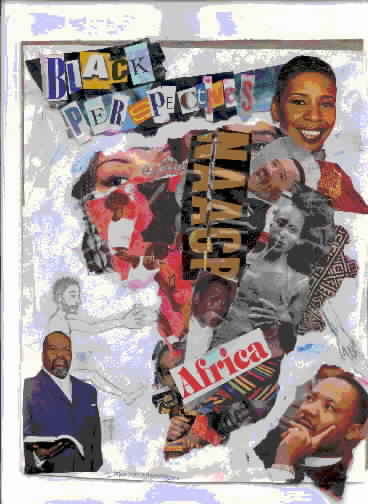 If you have some item of interest that you'd like exhibited on 'YOUR PAGE', such as photographs(with captions), cartoons, or written works, you can e-mail to: Moses@blackperspectiveradio.com. Blackperspectiveradio.com does not guarantee privacy of work that is not protected by copywright. All works will be credited to the contributor. All attachments are scanned. No submissions will be returned and there is no guarantee that any submission will be used. Absolutely no pornographic work of any kind will be accepted, as well as, any use of profanity(think of the five words that cannot be used on radio or television). with whites, except in sports and entertainment. balance of power in America. every dollar whites spend on fish, blacks spend $9 on fish. what business we should be in as Blacks? hearing the deal Bob Johnson received for selling BET. 9. Ninety-six % of all black inmates are men. leaves the community soon as he or she earns it. By the way, the word "race" hit the English language in the 16th century when Europeans held a contest to see who will win the race to gather the most wealth through exploitation of blacks. You must read Powernomics by Claude Anderson. This is our blueprint to create wealth, not just have a job, but be a business owner, so you can hire people, be listed on the stock exchange, develop businesses to meet our needs. This is "Good Food" for thought. It's another day at the office. That's where I am from, God bless U.S.A. I never thought I would be here. Sitting down in this brown plain chair. I never felt so scared. Are any of our actions free? into what everyone wants them to be? "America's High Tech "Invisible Man"
almost everything in your life has been affected by his work. National Hall of Inventors. He has more than 30 patents pending. He is a vice president with IBM. Oh, yeah. And he is also the architect of the modern-day personal computer. Dr. Dean holds three of the original nine patents on the computer that all PCs are based upon. And, Dr. Mark Dean is an African American. personal computer without reading or hearing a single word about him? would be a slam dunk to highlight someone like Dr. Dean. Alexander Miles and his elevator, Lewis Latimer and the electric lamp. information technology can be traced back directly to Dr. Dean. Dr. Dean already was leading the way. such as modems and printers, to be connected to personal computers. In other words, because of Dr. Dean, the PC became a part of our daily lives For most of us, changing the face of society would have been enough. But not for Dr. Dean. Still in his early forties, he has a lot of inventing left in him. the most stunning technological advance the world has ever seen. We cannot afford to let Dr. Mark Dean become a footnote in history. He is well worth his own history book.